"Gun free zones" simply filter out those individuals with good intentions and do not stop those with bad intentions. This form of "gun control" is the product of emotionally stupid "gunophobics" who have no experience with firearms, are afraid of firearms, and do not trust anyone with a firearm except the police. 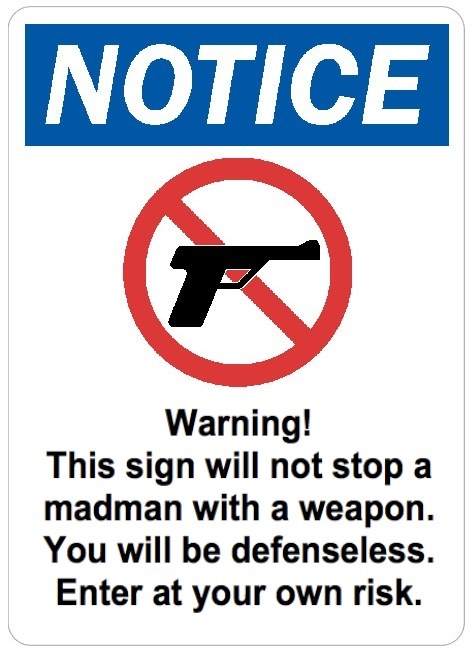 Mass shootings occur when an active shooter blows by these signs and there are no police present to defend those who are made defenseless by these irrational signs. The tragic Aurora, Colorado theater shooting proved that gun control does not work. The theater was posted as a no carry zone. There were no security people provided. The back door was not alarmed. There was no posting stating that "This no carry zone will not stop a mad man with a weapon. You will be defenseless. Enter at your own risk." Under Colorado law, the theater chain had the right to prohibit concealed carry on their property. However there is no Colorado law preventing the victims and their families from having the standing to sue this theater chain out of existence for reckless endangerment. Download a comment sheet submitted to the Rock And Roll Hall Of Fame. With more than eighteen million people in this country now having a sense of duty to legally carry a concealed handgun, about one in thirteen adults now carry. If there were 200 adults in that theater, today there could have been fifteen who carried had they been permitted. 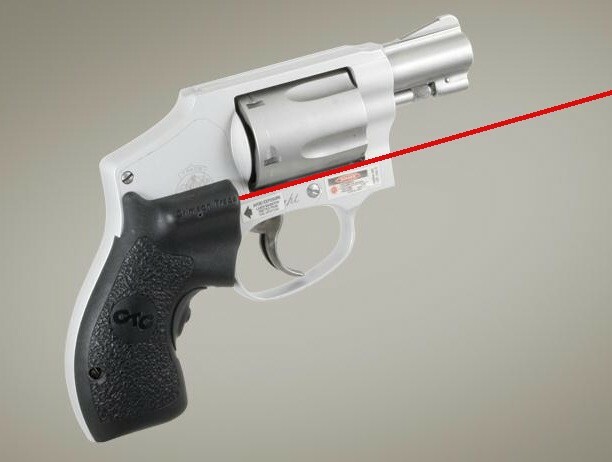 Many carry handguns having laser grips that project a red or green dot at the point of impact that would allow hiding low behind cover and holding the gun to the side and shooting up for a head shot. There are less than 680,000 non-federal police in this country. Because of 24 X 7 coverage, only about one quarter of those are on duty at any time. With vacation time and time off, that equates to one on-duty policeman for every 2,000 citizens. There is no way the police can protect us from ourselves. This senseless tragedy will convince a lot more people to be responsible for their own security. How To Apply For A Concealed Carry License In Ohio, Pennsylvania, And Florida. I had just attended a meeting with other people who had also started small businesses and were trying to assist each other in creating more value for their customers. I was standing on the northeast corner of West 26th and Lorain Avenue in downtown Cleveland, Ohio. I was waiting for traffic to clear on Lorain so that I could cross Lorain and walk to my car that was about four car lengths south on the east side of West 26th. Lorain Avenue runs east and west and has two lanes of traffic in both directions and was busy that night. When looking for traffic in both directions on Lorain, I noticed a man staring at me who was standing on the west side of West 26th. Everytime I looked in his direction he was staring at me. He could have crossed from the west side to the east side of West 26th at any time and stood next to me but he did not. Once traffic on Lorain cleared, we both started to cross this wide street. I was walking straight towards the southeast corner and so was he. He was walking quickley on a diagonal and he had his right arm hidden behind his right side. I started to run east and reached into my right pocket, grabed the grip of my small revolver, and pulled up without brandishing and he made a right turn and walked to the south west corner and watched me all of the way to my car. I reported this to the Cleveland Plain Dealer in response to an editorial deriding concealed carry. One of the editors asked me what I would have done if he continued coming at me. My answer was simple. I would have continued to run away and scream "stop I feel threatened, stop or I will shoot!" By that time he would have had a red laser dot on his center of mass and he would have had to make a decision. I could not report this incident to the police because the meeting I attended was held in a place that served wine and, although I did not drink, Ohio law at that time made concealed carry there illegal. Ohio law has changed since then. From 1960 to 1992, the violent crime rate in the U.S. increased by a stunning 470% as shown in the graph below. As discussed in "Gun Violence", the increase in violent crime was caused mainly by young males in an increasingly degenerative drug culture. But then something changed. From 1992 to 2005 the violent crime rate decreased by 180% of the 1960 rate. A contributory cause of this decrease was that, beginning in 1986, the number of States that passed "shall issue" and unrestricted concealed carry laws increased from 8 to 40. This increase in the number of "shall issue" and unrestricted States was driven by the increase in violent crime perpertrated upon peaceful citizens. 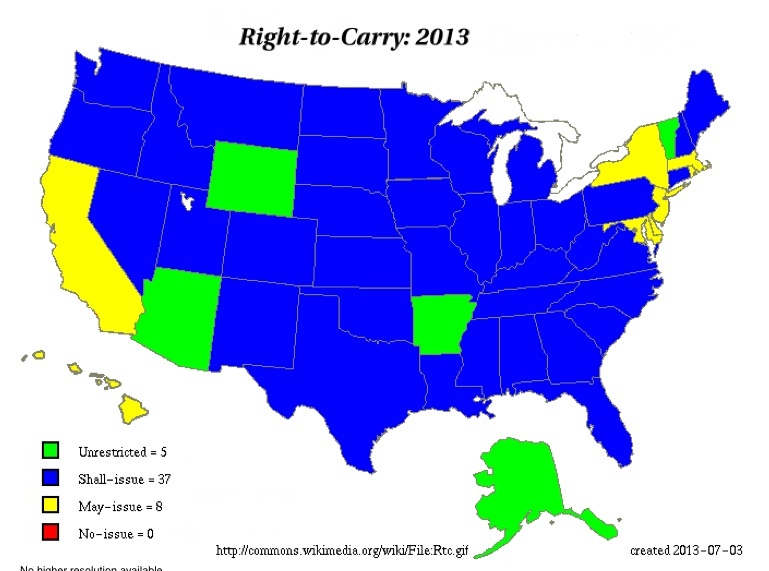 There are 49 States that permit legal concealed carry to varying degrees. Of these there are 39 "shall issue" States that issue concealed carry licenses based upon meeting a set of requirements that do not include showing abnormal risk or need and three states that do not have any license requirments at all. The States with "shall issue" laws do not have arbitrary, capricious, and politically motivated sheriffs and chiefs of police preventing peaceful citizens from defending themselves. There are 8 "may issue" States that require police or sheriff’s approval. Of these there are 6 States that require abnormal risk or need to issue a concealed carry license, unless you happen to be rich and famous or politically connected. "May issue" States issue far fewer licenses than "shall issue" States. Illinois was the last State to enact a "shall issue" concealed carry law because of the inbred single party patronage of Cook County that pretty much controls Illinois politics. Click here for the website with information on individual State laws. The United States has a population of about 310,000,000 but only has about 680,000 non-federal peace officers. (For some reason, the FBI web page containing this information is no longer available.) This number of non-federal peace officers represent only about 0.2% of the population. But this gets worse. With these officers on four crews covering three shifts, along with time off and vacations, at any given time there is only about one on-duty officer for every 2,000 citizens. We have a very thin line of security that cannot be in all places and cannot protect everyone. Also, the Supreme Court has ruled that police are under no legal obligation to protect individual citizens. Their job is to enforce laws and maintain order. Consequently the individual has been put in the position of having to assume responsibility for his or her own security. Many crime victims are victims to our society's undying trust that if we are law abiding then others around us will also be. And those who are not law abiding will be dealt with swiftly by law enforcement. Such is the great naive American myth that pretends that predatory thugs do not exist and that we do not face increasing danger from drug cartels and religious extremists. As of 2016, more than 18,000,000 or our fellow citizens in this country (about 5.0% of the U.S. population or about 1 in 13 adults shown by State below) carried licensed concealed handguns out of a sense of duty to deter violent crime. As a consequence of the increasing dependence upon concealed carry for instant crime deterrence, all "gun free zones" that have no deterrence are becoming more asymmetrically dangerous. There is an infinite difference in deterrence between instant responders and first responders. Concealed carry provides an instant deterrence to many potentially violent incidents and is helping to reduce the violent crime rate. The writer does not need statistics to prove this fact because he has personal experience. As in my case, the majority of occurrences of instant deterrence are not reported. Concealed carry provides a deterrence to violent people preying on peaceful people. It is not intended to stop violent people from preying on other violent people as in the "business killings" associated with drug trafficking. Most of the handguns carried are very small revolvers and semi-automatic pistols that are purely defensive and can be easily concealed in a pocket holster. Light weight hollow point bullets are often used along with a laser that projects a red dot at the point of impact. Both the hollow point bullets and the laser are used to maximize the possibility of only hitting the assailant. Although open carry is legal in Ohio and in a number of other States, concealed carry is preferred because: 1. Open carry allows the criminal to know who to shoot first in order to get another gun. 2. Open carry creates an unnecessary problem for peace officers when open carry is reported by fellow citizens. Many people become naturally distressed at the sight of a gun not worn by a peace officer. It is inevitable that we will have a Federal policy that provides uniform requirements for concealed carry, similar to Ohio’s, and allows the instant violent crime deterrence of concealed carry nationwide.